A New Year's Eve in Estes Park turned into a pretty cold vacation. Ryann and I decided to take a mini vacation and stay over night in Estes Park, just west of Loveland. We thought we would go up early Friday morning, stay over night and ice climb both days. Little did we know it was going to be hovering around zero the entire time. The cold, coupled with ridiculous wind, kept us from climbing either day. However, Sunday after our stay in Estes we got out and climbed at Hidden Falls. We were determined to get at least one day on the ice and the temperature let up a little bit. A few friends were going to meet us there, and a couple we didn't expect to see, for a day on some pretty bullet proof ice. The hike in went well and Ryann and I got there before our friend Ryan who was supposed to meet us. As we walked up a couple came off the top after setting up their anchor and said, "Ryann and Bryan?" We were stunned and had no idea who these people were. They continued to explain that they were friends of Ryan and knew that we would be there. Ryann and I setup a top-rope and had a great time running laps on the flow. Ryann did really well with her swings and really started to get comfortable with ice climbing. She was super excited about our upcoming trip to Ouray for the ice festival. About an hour later another group of friends showed up that we didn't expect to see. My friends Austin and Dan walked up after missing the cutoff trail to the falls. Apparently they hiked about 5 miles, the hike is only 2! We had a laugh and we all climbed a few times. It was still bitterly cold as Ryan and his girlfriend finally showed up. They got a late start and didn't even climb. Ryan convinced everyone to get in one or two more laps and then we headed back to Estes for drinks and food. We all left together and got drinks at Ed's Catina to round out the day. We swapped stories and had good laughs, beer and food. All in all it was a good day after such a cold and windy weekend. 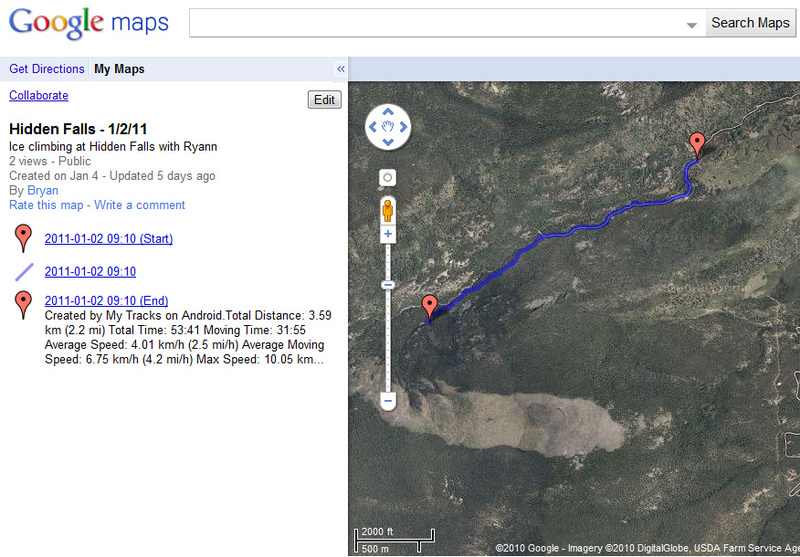 Here is a map of the hike to Hidden Falls. I recorded it using the "My Tracks" app on my Android phone. Check out all of "My Tracks" here. I can't believe you left out the part about how we froze I Mohawk for you! Just kidding-- great post! So cold!